The Municipal Art Society of New York (MAS) has supported sound planning and effective community engagement in New York City for 125 years. Our advocacy extends to the examination of projects and initiatives such as the Hunts Point Interstate Access Improvement Project (Hunts Point Project), which have the potential to result in adverse effects on city neighborhoods. MAS has serious concerns about the Hunts Point Project on planning, procedural, and environmental grounds. We believe the construction of a new highway ramp from the Bruckner Expressway to the Hunts Point Food Distribution Center would have drastic impacts on the South Bronx, a community that has been disproportionately beset by poor planning, destructive highway projects, forbidding pedestrian access, and a disconnection to the Bronx River and area parks. 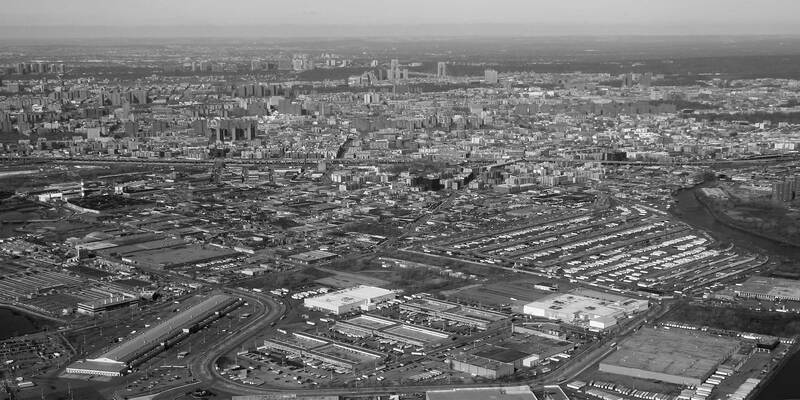 The Bronx with the Hunts Point Cooperative Market in the foreground. Photo: Wikimedia Commons, Doc Searls. The South Bronx has been subjected to a shameful history of highway projects being built without any community input. Our primary concern today is the New York State Department of Transportation’s (NYSDOT) refusal to consider and evaluate the alternative identified in the 2013 Sheridan Expressway-Hunts Point Land Use and Transportation Study and by the Hunts Point community that would place the highway ramps at Oak Point and Leggett Avenue, not Edgewater Road. The community alternative would route traffic away from area parks and residences through a more industrial area, thereby mitigating most of the concerns detailed here. MAS and many area stakeholders were encouraged by Governor Cuomo’s March 2017 announcement that the Sheridan Expressway would be decommissioned from the interstate highway system and redesigned as an at-grade boulevard with improved pedestrian and bicycle access, enhanced streetscaping, and a new pedestrian bridge that would reconnect residents with Starlight Park, the Bronx River, and the Bronx River Greenway. We felt the project would right some of the previous planning wrongs. However, without fully exploring the Oak Point–Leggett Avenue alternative, the Hunts Point Project, as proposed, is a major step in the wrong direction. We fully acknowledge the importance of the Hunts Point Food Distribution Center as a vital economic engine for the city. However, we also recognize the equal importance of effective community engagement for a project of this magnitude. It is important to strike a balance between satisfying the economic needs of the region with those of the affected community. This is especially critical considering the poor planning and the environmental justice issues Hunts Point residents face as a largely low-income, minority community. Almost 30 percent of project area residents live in poverty, and the community is saddled with some of New York State’s highest asthma rates. Throughout the project scoping period, neighborhood residents expressed the desire for NYSDOT to explore a less intrusive option that would route truck traffic to and from the Hunts Point Food Distribution Center, away from residents and schools. As such, we strongly urge the project administrators to rigorously evaluate the Oak Point–Leggett Avenue alternative and seek additional public input into the final design. In addition to our primary concerns, we have the following comments and recommendations regarding the project DEIS. The Longwood and Hunts Point communities have long been victims of environmental injustice resulting from the construction of highways through the neighborhood and the subsequent degradation of water quality and ecological conditions in the Bronx River. Recent efforts by the Bronx River Alliance and other stakeholders have improved ecological conditions in and around the river and increased public access to the Bronx River Greenway. In light of this progress, the Hunts Point Project would be a major setback for the community. We believe the project would further obstruct access to the Bronx River and contribute additional harmful stormwater run-off into the river. However, the project DEIS fails to address these concerns properly and does not evaluate any alternatives that would minimize or eliminate these impacts. The chronically poor air quality and high prevalence of asthma-related illness in this area demonstrates the need for NYSDOT to minimize and mitigate air quality impacts to the greatest extent practicable. With the nearby highways and local truck traffic to and from the Hunts Point Food Distribution Center, ambient noise presents a challenge for the Hunts Point neighborhood. With the proposed project, a number of schools and other sensitive resources identified in the DEIS would experience noise levels over 65 decibels, which is not conducive to an appropriate learning or living environment. The DEIS states that noise abatement options are not feasible and are not recommended for further study. We find this conclusion to be unacceptable. We urge NYSDOT to work with area stakeholders and explore ways to reduce noise impacts. The Final Environmental Impact Statement (FEIS) must include some potentially feasible means of mitigating the noise impacts from the project. Given the impacts during project construction and the long-range impacts during operation, we find NYSDOT’s public engagement efforts to be patently deficient. The public was not able to provide meaningful input on the Oak Point–Leggett Avenue Alternative (that was approved by the community and the City in 2013), and the public was given only 30 days (later extended to 45) to review the 400-page Draft Design Document and DEIS, which includes over 3,000 pages of appendices. The limited time window and lack of consideration for the community-approved alternative continue a long history of poor community engagement on the part of City and State administrators for large-scale transportation projects in the South Bronx. This calls into question the legitimacy of NYSDOT’s claims to the contrary. According to the Draft Design Document, the project will require the acquisition of the 13,191-square-foot Lot 160 within Concrete Plant Park, which would then be used for the construction, inspection, maintenance, and future rehabiliation of the new Edgewater Road ramps from the Sheridan Boulevard and eastbound Bruckner Expressway. The elevated ramp structures would have piers with columns on Lot 160 to span over the existing Amtrak and CSX railroad. The Draft Design Report states that the NYSDOT determined that there is no other feasible geometric alignment that would avoid passing through Lot 160 due to site constraints posed by the existing railroad ROW and Bronx River to the east. As a mitigation measure for the impacts on Lot 160, the Draft Design Document describes proposed improvements to the 1.10-acre Garrison Park, located immediately south of Lot 160. As part of the potential mitigation, NYSDOT proposes to construct a formal entrance to Garrison Park with a signalized rail crossing, a park entrance with signage, a shared-use path, viewing platforms, improved landscaping that would provide a buffer between the proposed ramps and provide supplemental vegetation, and a sidewalk along Edgewater Road. In light of this action, we are extremely disappointed by NYC Parks’ decision to support the taking of Lot 160, based on its October 13, 2017 letter included in the DEIS, and accepted the proposed improvements at Garrison Park. We question why this transaction was not considered an alientation of municipal parkland and subject to approval by New York State legislature. Furthermore, the stated mitigation measures notwithstanding, we find this to be an unacceptable permenant use of public parkland in a neighborhood that has long suffered from a dearth of open space. We are strongly opposed to the use of this parcel for the construction of a highway ramp. As such, we implore the NYSDOT to find an alternative means of achieving its aims without destroying or diminishing the value of this portion of Concrete Plant Park. For over half a century, the South Bronx has been effectively cut off from the Bronx River, Starlight Park and adjoining neighborhoods by massive highway projects that ignored the concerns of the affected communities. The Sheridan Expressway, in particular, greatly contributed to the economic decline of the area starting in the early 1960s. As proposed, the Hunts Point Project would continue this pattern and result in drastic impacts. We implore NYSDOT to fully explore and evaluate the Oak Point–Leggett Avenue alternative and to seek additional public input into the final design of the project. Zip Codes 10455, 10459, 10474 are all partially or wholly within the study area identified in the DEIS.